RARE NAPOLEONIC PRISONER-OF-WAR BANKNOTE FORGERIES. 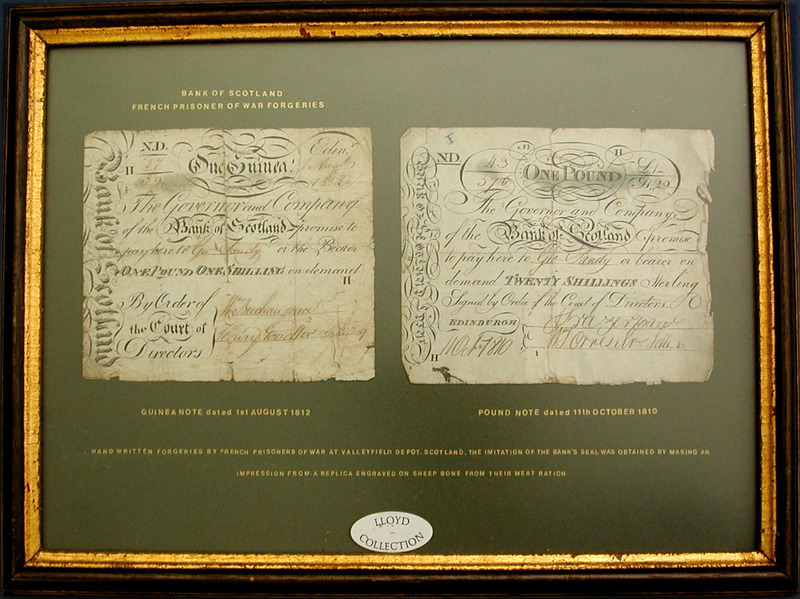 Two elaborate, hand written, bank notes made by French prisoners held at the Valleyfield Depot in Scotland. One forgery represents a "One Guinea" note issued by the Bank of Scotland. Dated "1 Aug 1812". The second example representative of a "ONE POUND" note also issued by the "Bank of Scotland". Dated "11 Oct 1810". Both measure 4/3/4" x 5 1/2" and are nicely mounted and framed with descriptions directly applied to the mat board. Overall size 11 1/4" x 15". Condition exceptionally good with edges only showing minor wear. Fascinating examples that show the ingenuity, patience and skill of the nefarious minded prisoners of that era who had remarkable calligraphy abilities. From the well known "Lloyd Collection of Napoleonic Prisoner-of-War Artifacts" and illustrated in the catalog of the collection, items 102 & 103.